•Speed: If you think that wireless network transmits data at the same rate as fiber optic cable does then you are wrong. 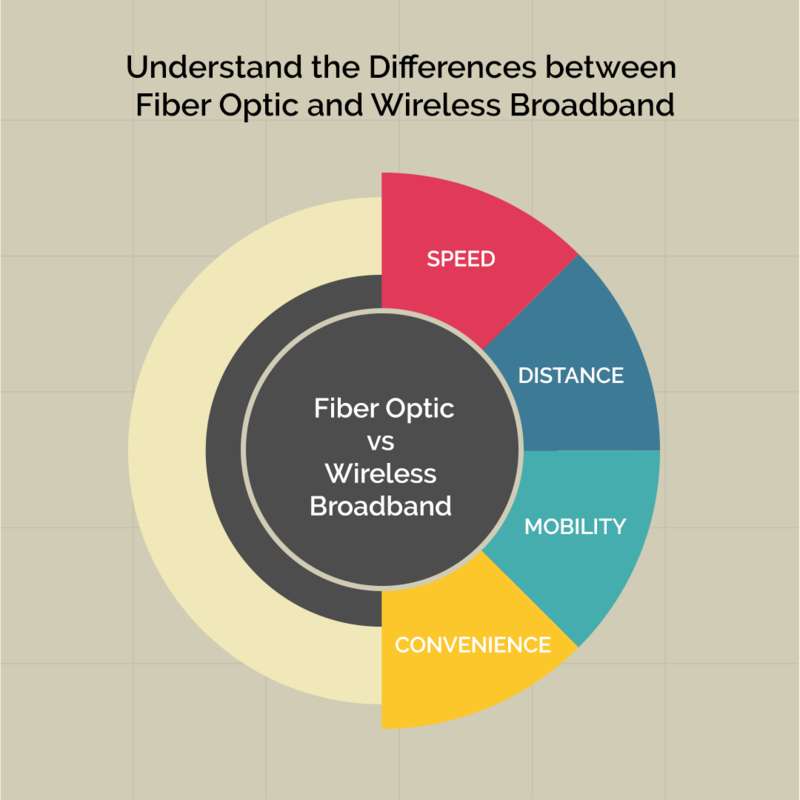 If you find difference in speed in both the networks, you will find that fiber optic provides much higher speed than wireless network. For example, wireless network becomes quite slow during peak hours because all users of wireless network start sharing the same network and its bandwidth. Due to the congestion of the network, wireless connection becomes slower whereas fiber optic network does not get affected in such situation. The connection speed remains good even during peak hours. •Distance: The signal with a wireless connection gets degrade with distance. In fact you must have noticed that wireless connection is only meant for a limited area because when you go far away from the signal range or modem, you start losing network or start experiencing fluctuation in the signal. But in terms of cost, wireless connection is quite cheaper than fiber optic. The cost of a fiber optic connection is so high in those areas where internet service providers need to lay down the fiber optic cable to provide you the connection. In that manner, the connection becomes quite expensive and it is not a wise call to get this connection at higher rate then. •Mobility and Convenience: Today people need more freedom and comfort to enjoy life. Similarly when it comes to getting an internet connection, they all want a modem or device which they can carry here and there without any trouble. When internet has become an essential part in today’s life, no one wants to disconnect themselves from the web world. Therefore portable devices are there to provide web access to the users anywhere anytime. While you are moving or travelling, wireless device is quite handy in accessing the web world. Similarly when you check-in in many hotels, coffee shops and restaurants, you don’t need to ask for an internet wire, you just need to get connected to a wireless network of these places to enjoy web access. However, there are many areas in India where wireless network is so weak or not working. In this case, you need a fixed line connection to access web world. If you look the difference carefully between these two technologies, you will find both pros and cons in each of the technologies. Many a times, having a wireless network is quite handy and sometimes, a fixed line connection like fiber optic can fulfill your need. If you don’t any issue in paying little more on connection then it is a better call to go for fiber optic network over wireless network. Before getting this connection, check whether it is already exist in your area or not because getting a new connection or installing the same network may cost you quite much.